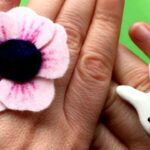 We love to recycle and we also LOVE making own craft materials.. and one craft material that is great to make yourself, as well as fabulous to craft with is T-Shirt Yarn – it is super quick and easy to make and there lots of fabulous ideas for what to make with it. T-Shirt Yarn is particularly popular with “chunky crochet patterns”, but we have been looking for a mix of T-Shirt Yarn ideas for kids, for grown ups, for people who like to crochet with t-shirt yarn and for people that don’t!! Hopefully you will find lots of wonderful inspiration. 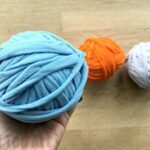 If you want to have a go at making your own T-shirt Yarn, we have a great quick and easy How to make T-shirt Yarn tutorial for you here! I love using the kids’ old worn out t-shirts for this, or those “corporate T-shirt freebies” you often get but don’t quite know what to do with. Alternatively go to the charity shop/ thrift store and get some old t-shirts then. 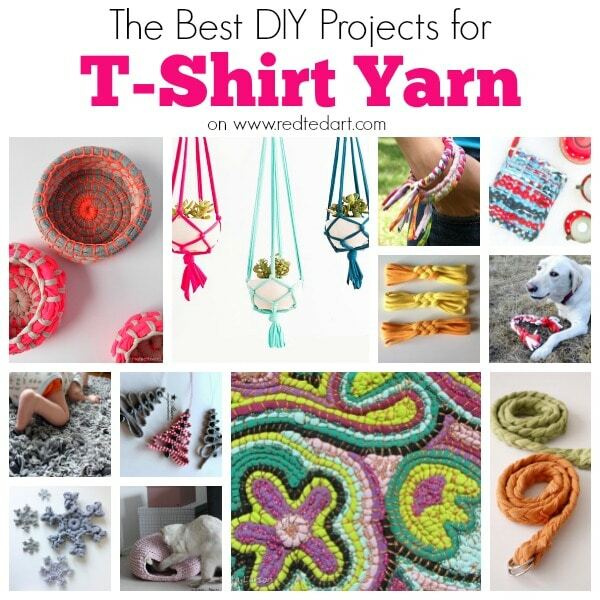 Once you have made your own T-Shirt Yarn, come back and check out all the great ideas here! The T-shirt Yarn Projects for Kids, also double up nicely as great Gifts Kids Can Make at Christmas or Mother’s Day too! 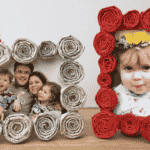 TOP TIP: as with ALL recycled crafts, the craft WILL be impacted by the quality of your recycled materials. I nice combination of colours can make ALL the difference to your T-shirt Yarn projects, so do give those some thought. This was a really hard section for me to work on, as it T-shirt Yarn Projects for Kids REALLY depend on the child. Some kids taking to working with yarn or wool really quickly, others take a bit longer. Also, many T-Shirt Yarn Projects take a little longer (e.g. the fabulous hoola hoop weaving rugs or the rag rugging). 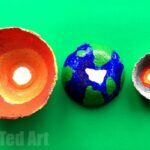 Technically, these can easily be done by kids BUT it depends on whether they are interested enough in completing this project. So. I have put together a list of what I **THINK** some children may enjoy.. BUT these projects DO also repeat in sections below, so that no one misses anything depending on your interests! 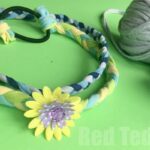 Easy T-shirt Yarn Hairbands – these are super quick, easy and fun to make! Love this clever SPIDERS WEB made from sticks and upcycled T-shirt Yarn. Cool! From The Twitchetts! 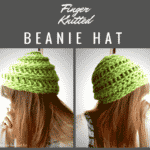 This T-Shirt Yarn DIY section is your mix and match t-shirt yarn ideas – below we have accessories and crochet – which are popular T-shirt yarn projects, but the ones in this section are a bit of everything. We begin with How to make T-shirt Yarn (of course!) and end with rag rugging, pom poms and the quirkiest project yet – T-shirt Yarn flip flops! Love. This hand SEWN RUG with T-shirt Yarn is a work of art. By Hata Larson, via this site. As t-shirt yarn is very chunky it is great for kids’ weaving projects – you can make fast progress and complete t-shirt yarn weaving projects quickly. Remember, when weaving with T-Shirt Yarn it is really important to consider the colours you are using. The combination of colours that go well together will make your projects look extra special. We love our pets and we love fabulous Pet DIYs. Here are a couple to wet your appetite. The Dog Toys are PERFECT for using up odds and ends of t-shirt yarn. With the dog toys it really doesn’t matter what colours you use and whether they go well together.. it is a fabulous upcycle! Another super simple Dog Toy is this “twist and curl” technique – VERY easy and I remember using the technique as kids – check it out at The Twitchetts! There is a broad mix of T-Shirt Yarn Accessories. 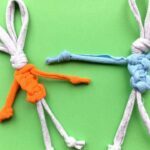 Hairbands are popular t-shirt yarn DIYS and you can go from very simple braided t-shirt yarn hair accessories, to macrame hair bands, necklaces and scarves. Start with the simplere T-shirt Yarn Accesories with younger kids.. and work you way up to the more complex one with teens and grown ups! T-shirt yarn is BRILLIANT for both crochet and knitting. It is like chunky wool and has a unique texture and look. Many people prefer to buy t-shirt yarn for crochet projects, but I think, so long as you give the colours and the pattern requirements some thought, you can still repurpose old t-shirts to make many of these projects. There is something very satisfying from creating some new from the old. I hope you found this T-Shirt Yarn DIY projects inspirational and that you will now look at old t-shirts in a complete new way. Remember, even patterned / printed on t-shirts can be repurposed for T-shirt DIYs… and those “corporate XXL” t-shirts that no one wants to wear are especially good!! Enjoy and happy crafting!